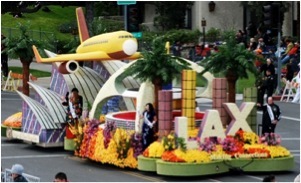 The Sister Cities of Los Angeles were featured in the Los Angeles Tourism and Convention Board's float in the 2013 Tournament of Roses Parade. 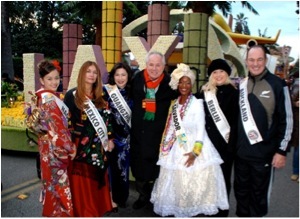 The Sister Cities of Los Angeles signpost was prominently displayed on the float with six riders in costume representing Auckland, New Zealand; Guangzhou, China; Mexico City, Mexico; Berlin, Germany; Salvador, Brazil; and Nagoya, Japan. (Above, Councilmember Tom LaBonge stands with the participants.) The float, entitled "Making Connections" for its LAX theme, won the Mayor's Trophy for most outstanding city entry. Congratulations, Sister Cities of Los Angeles!